Q: Do I need to be a geek to join the club? A: Absolutely not! Denise and I don't consider ourselves geeks. But we love geeks! And there are quite a few geeks in the club. If Doctor Who is your thing, you'll be pleased to know that it's a frequent topic of discussion in the Facebook group. Harry Potter, Star Trek and Star Wars fans are also welcome! But if you don't even know who the heck Doctor Who is, then that's OK because many of us don't have a clue either. The most important thing to know is that we don't discriminate. Geeks, Whovians, Trekkies... Nerds, artists, weirdos, hipsters, MILFs, who cares how you label yourself! You're welcome in the League of Extraordinary Penpals, as long as you have at least one hand to hold a pen and write a letter with it and/or no hands but the ability to write with your feet or mouth. Q: But what if I'm not into superheroes? Q: What's that LEP Facebook group about? A: Oh that! Well, it's only the best penpal community in the galaxy! We post pictures of our incoming and outgoing mail, we chat about letters and stationery, we do all sorts of random acts of kindness, we keep each other informed about mail related projects, we post pictures of our cats and dogs & random baby animals, we tell jokes and sob stories, we ask for help and support (and give it too! ), we discuss deep as well as silly issues, we make friends and penpals and sometimes we even meet kindred spirits. We're a big family of 500+ members. Q: Do I have to join the Facebook group in order to be a member? A: Not at all. You can still read the newsletter and participate in all the other activities (swaps & giveaways) without being a part of the Facebook group. But we'd lie if we told you that you wouldn't be missing out on something extraordinary! Q: When does the newsletter come out? A: Every issue of LEP Monthly comes out on the first of each month. However, not all members are in the same time zone, so if you're in Australia, you might get the newsletter on the second day of the month. Sorry, Australians! We promise that we don't have anything against you. In fact, we quite like our Australian members. So if you live in Australia, please join! We will automatically love you. Q: Who are LEP members and where are they from? A: Mostly women, but some men too, and some gender-neutral folks, coming from all parts of the world: we have members in Canada, the USA, Australia, the UK, Germany, the Netherlands, France, Greece, Norway, Belgium, Finland, Sweden, Spain, Austria, Italy, New Zealand, South Africa, Singapore, Indonesia, Hong Kong... LEP is a penpal club for adults only, so our younger members are 19-20, and we do have a couple of members in their sixties. But the vast majority of members are between 22 and 54. The most popular age group would probably be 24-36, then 37-54, then 19-23. We don't care that much about age anyway, so you shouldn't either. Meeting people from all walks of life is fun. That's why we're into letter writing, isn't it? A: Exactly 509 as of December 2018. 485 of them are in the member database with their address and interests, and 441 are in the Facebook group. 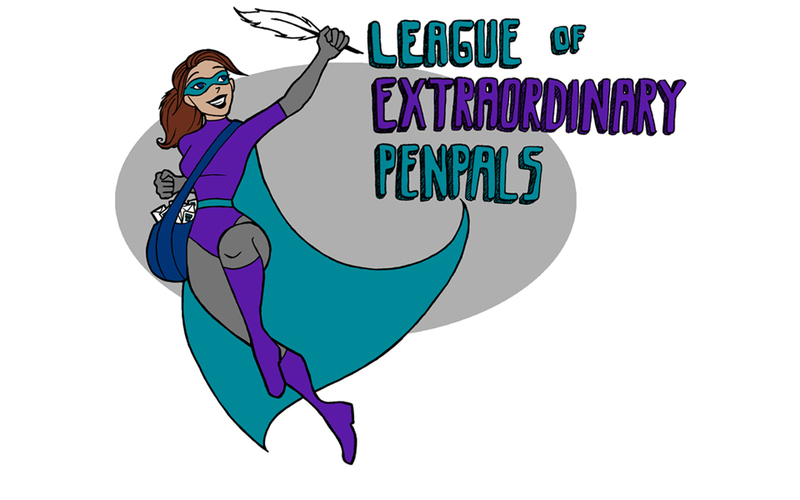 Q: Who are the people I see on the top right of the page under "Penpal Superheroes;" are those LEP members? A: Yes and no. Some of them are current members, some of them are old members, and some of them were never members at all. They're actually blog followers. Lovely folks I'm sure, but not necessarily members of the club. Q: When was LEP created? A: The penpal club started existing in Super Sushi's head in the 1980s, but it officially came to life in January 2013. The first issue of LEP Monthly came out on February 1st, 2013. Q: Why is this a paying service? A: Did you ever notice that free stuff often attracts weirdos? And we don't mean the good weirdos like you and us, but the scary weirdos that make you want to put your head in the toilet and hide there for a few hours... Yes, those types of weirdos. Plus we're sharing our deepest fears and struggles and joys and accomplishments with each other in the Facebook group, and we can choose to share our home address in the member database if we want to, so it's safer to keep this between trusted people. LEP is a drama free community, and there's a lot of work involved to create content and a friendly environment, so the small membership fee is well worth the benefits according to most members! Q: What if I have a question that's not addressed in the FAQ? A: Then email us and we'll be happy to help you out! Q: I'm ready to join! What do I do now? A: Awesome! Go here to become a member. Cheers!